Let us do the training for you. During this time and age, training our pet is normally on the bottom of the Priority list. It is important that time is spent to properly train your dog, the sooner the better, but its never to late. If you are going on vacation, this would be a great time for your dog to board and learn at the same time! Read below on what will be covered. with this program & hopefully, we can help you & your dog too! kennel. They are very efficient. allowed to rest, recover and retain the training over a period of time in order for the training to be most effective. The method we use is positive reinforcement with proper, timely corrections. The best way to get the most accomplished is to write down the problems you are having. Make it specific. necessary and 2nd dose of frontline to be used on exit. We feed good quality dry kibble. If you would like us to feed a special diet, you will need to provide it. boarding & training dogs per month. We can also customize a program for you with our weekly training programs. 808-987-6764. We look forward to hearing from you and meeting your dog. Aloha Ted, I hope everyone is as well and happy as when I last saw you. I realize this testimonial is quite overdue, but it’s very heartfelt, and I hope you find it helpful. During lots of instruction and education over the years, I’ve formed a pretty rigid list of important qualities in an instructor. Knowledge first, followed by patience. Consistency, enthusiasm, integrity, clarity (of plan and communication). These qualities describe Ted and his training perfectly. The deliberate, methodical, unflappable way he works with dogs and owners is extremely effective, while producing the happiest and most responsive dogs I’ve ever seen. I don’t know how he does it, but he does it really, really well! Craig C. KimuraRe: 17 month old, 89 lb., uncontrollable, non-vicious, black labrador retriever mix male. Although it has not been more than a few days since bringing our Miah back home from the 28 day training program, we are able to see a world of difference with her behavior. As you found out, Miah is a very driven, high-energy dog…and unless that enthusiasm is channeled in the right direction, she can still be adorable, but can also be uncontrollable. It’s been about 3 weeks now since Miah’s graduation from your 28-day training program. She is doing extremely well with all aspects of basic obedience (walking, sit, stay, down, etc) and now she also will consistently roll-over on-command…she knew how to do it before, but using your same training methods, she is much more consistent with this particular trick. We are so happy to have her back, but our happiness is really due to the fact that Miah is now a controllable, enjoyable part of our family and I look forward to training her everyday. I’ve made it a habit of doing about 15 minutes of concentrated training with her daily (as you recommended), and it has truly kept her up to par and more! Just a few days ago, Miah did her entire formal training (walking, sit, down, stay, both of her heel commands) off-leash! 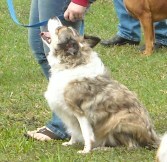 This would have never seemed possible before her training at Alpha K-9 Kennels. She is so good and we are so proud of her progress! And I am serious in saying that you can really see her progress every single day. It seems as though everyday, she’ll do something unexpected (in a good way!) to amaze us. Miah (as well as most Shepherds) are extremely intelligent dogs, so we realize you MUST vary your training with them in order to keep them from “mind-reading” your next move/command. 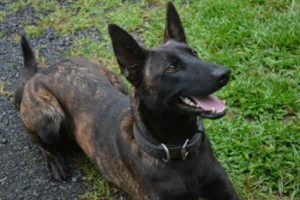 She will anticipate, but as long as we continue our training in the manner that you handed off to us – which really helped!!! – we will be just fine and will continue to enjoy Miah’s company for years to come. We’ve recently moved to Kailua, and are located directly across from Kailua beach. Miah has taken quite well to the water and is an avid swimmer now…she loves to play on the beach. I mention this because before her training program, we would really have never been able to let Miah enjoy the beach in the manner she does now. She most likely would have run towards a distraction or made us chase her around the park to get her back under our control. But now, I can let her run and fetch her ball and go for a swim with little or no worry of her not returning to my side when I call her. Whether it be in our own backyard or at the beach, I just cannot put into words how much more of an enjoyable experience it is spending time with our little girl now that she has the right fundamentals for us to continue building on. Thank you again Alpha K-9 Training (and family) for providing US (because we as owners were “trained” as well) with the right tools to keep Miah as the loving, watchful family companion that she was meant to be!